« OMG! The Generators Are Off! Other than yesterday afternoon, when the sky opened up and dumped water everywhere, the weather was great and so was the fishing. Looks like a beautiful day today, but a little windy. A cool down coming up with tomorrow in the mid 60s, dropping to the upper 50s for Wednesday, but back into the low 60s Thursday. Moving into the upper 60s Friday. Temps keep going up, into the 70s Saturday and 80s by Sunday. Very little chances of moisture during this time except for a slight chance tomorrow, but that’s it. Generators off all weekend. We expect to see generation by 11:00 a.m. today….if not sooner. Not certain what the week will bring, but I imagine we will see some kind of generation during each day. That won’t be a problem once we get all this ugly algae blown out of the river. Ron and Renee, from Kansas, spent Friday morning on the water with Stan. This was Renee’s first time with a fly rod and she did pretty darn good. Ron has been fishing for quite a while and he had a hoot of a day. He caught most of his fish stripping the holographic green crackleback and Renee caught hers on a size 16 lightning bug. Carolyn took Walt and Jan out for most of the day. Good day for these two. Jan started out very good stripping an olive CQ streamer on a 2.6 ips sinking leader. Walt was also doing well on this, but Jan’s the stripper. Slow down in the action, so we moved and changed technique. Walt’s turn now to shine. It was the P&P midge until we pulled of the river. Last cast of the day, and Walt hooked into a nice 21-1/2″ rainbow. Way to go Walt! Saturday afternoon, Jim hit the river with Peter, from Florida. Their best patterns were the CQ streamer, P&P midge and a blood worm dropper. Our dearest, oldest and oldest fisher, Doc from Oklahoma, spent all day Saturday on the water with Stan. He is actually our first customer for a guide trip when we opened the business. (we won’t explain the rest of “oldest”) Great day for Doc on the copper dun and P&P midges. 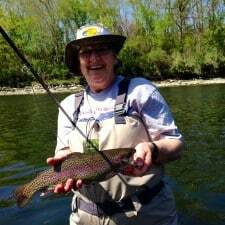 Meanwhile, up stream from Stan and Doc, we have to mention that Gina and Carolyn were in the midst of holding the first of our spring fly fishing clinics. As part of the learning, we teach a couple presentation techniques, nymphing and pulling streamers. 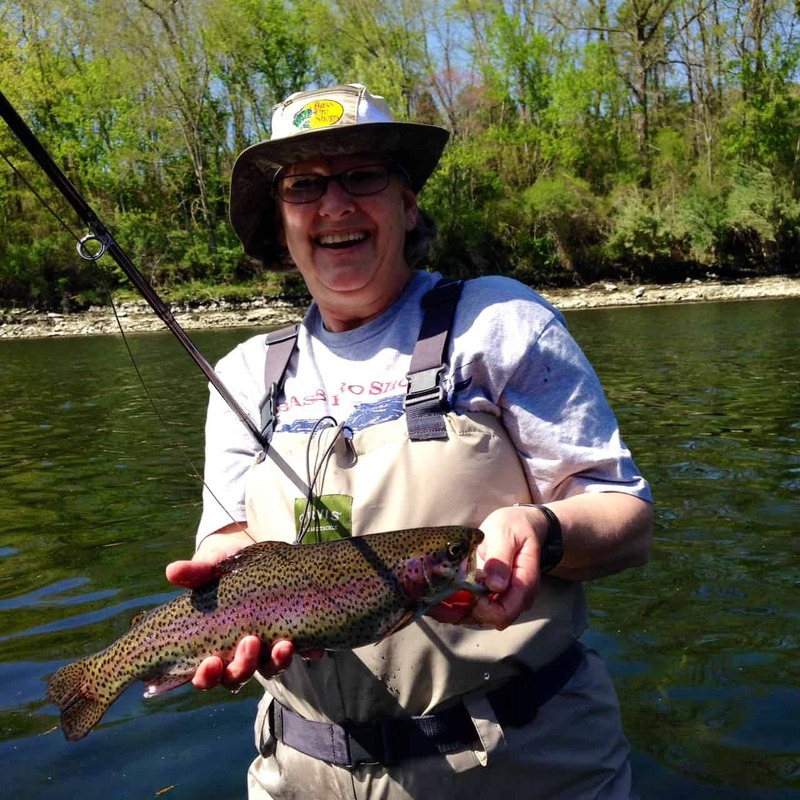 Maggie, one of the students really got serious and landed this nice rainbow on a P&P midge. She is well on her way to mastering this sport! 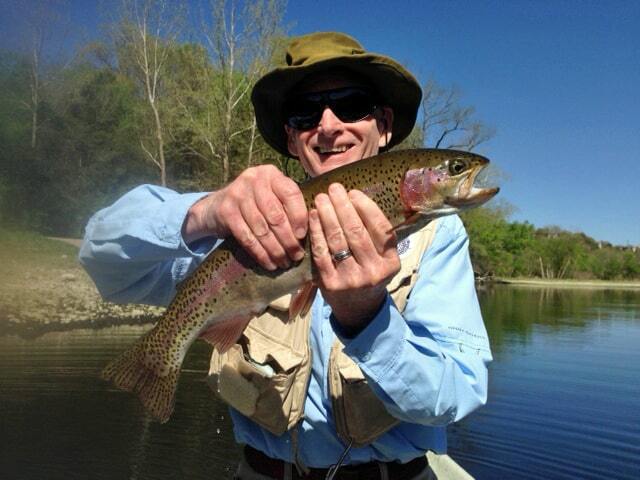 This entry was posted on Monday, April 28th, 2014 at 9:46 am	and is filed under Fishing Reports. You can follow any responses to this entry through the RSS 2.0 feed. You can leave a response, or trackback from your own site.